The sixth night after they were born. I just couldn't take it. I heard loud crackling in my lungs and I thought I had pneumonia. The next day my husband drove me to the same hospital where I delivered the boys and dropped me off at the ER. I walked in, and they got me in right away and took some blood. I explained my symptoms and they scheduled a chest x-ray. But before that they put in a potassium drip. That hurt soooo bad. The doctor later told me I was as clinically malnourished as a starving woman in Africa. I guess that explains why breastfeeding was hard. I have a whole new appreciation for those women now! So I got my x-rays and waited back in the ER triage. "Boy! You are sicker than I thought you were." "Well, you are in heart failure", he said, still sticking with the cocky tone. Really?? "Well it means your heart is failing". Cocky. "And what does that mean?" I asked again. Dude! Give me more details. "Well, you see, your heart is like a school bus and it's just not dropping people off in the right places". What?! What are you talking about!?!? "What does that mean?" JERK! He says, "It means we need to do some things, right now, to take care of you". Just then, two nurses came in, gathered my stuff and started wheeling me upstairs. I was wisked away to the CCU (Cardiac Care Unit). I still dIdn't have any idea what was happening. Everyone was speaking in acronyms. Nurse A was there to watch my vitals in the elevator. Nurse B was there for patient care. I looked up at her nice face, confused and scared, and asked "What's happening to me?" Holy crap is all I could say in my head. I am nothing if not polite, so I say "Thank you for explaining that to me. If it's gets scary, will you tell me please?" She laughed and said, "Yes, just let me know if you feel any pain or even pressure in your chest". "Ok, can you please call my husband?" is all I can squeak out. She tells me they already have. I get into the cardiologist's ultrasound room and BAM! I have to pee so bad it hurts! I go. I come back; they get half the electrodes put on and BAM! I have to go again. Take off electrodes. Pee. Back. More electrodes. BAM! Again. By this time, we were all frustrated. I was embarrassed because I had no clothes on except for my gown that was only attached by one snap. My breasts were leaking, I had a one-week old C-Section trying to heal and I was swollen all over. Hopping up and down from an exam table to the bathroom was not a pretty sight. Oh, and I was by myself. I told Michael to go home because I was not going to have my one-week-old twins, that I have almost killed myself over, sitting in some hospital waiting room. Those antibacterial lotion things on the wall don't fool me! So after they finally they got an ultrasound of my heart and I had gotten rid of some of the water, I was put in a room that said CCU. I had an intense, hyper cardiologist ask me tons of odd ball question like "When was the first time in your life you ever felt a pain in your chest?" I had two nurses still standing by and everyone was just staring at me, waiting. They kept saying, "If you feel anything in your chest like pressure, pain, or a squeezing, tell us.” We all just sat there for what felt like an eternity staring at each other. Awkward! Finally, Michael walked in, rushed over to hug me and started to cry. I had only seen him cry once before, so I was moved and touched, but now I was suddenly worried. Why is he crying? Am I going to die? I can't die. Hello, people! 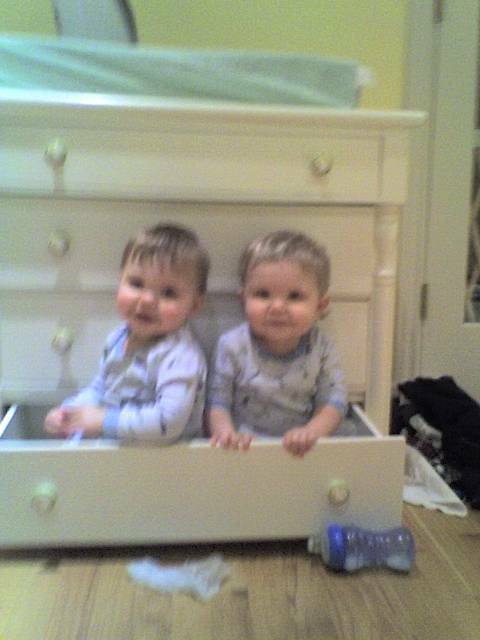 Anybody remember that I have twins at home that I have only known for a week? News flash! I was kind of in the middle of something here that I needed to attend to. Hello? No dying today. Then my mom walked in and the hyper cardiologist sinks his claws into her before she says hello to me. She is bewildered. But she is also dutiful and starts answering more questions "When was the first time Shari ever complained of heart pain?" Here we go again. After several minutes of “Twenty Questions” from Detective Cluso, I heard my mom blurt out "My mother died of uterine cancer!" She was maxed out, poor girl! Then my mother-in-law came in and she looked at me like I was already dead. She tried to smile hello but her smile put tears in her eyes. Now normally I would be touched by such a sentiment from such a "cold fish", as she likes to call herself, but I knew better. She was a NICU preemie nurse who got sick of how the doctors treated her and went back to school to become a malpractice attorney. She is tough and doesn't over-react. "For her to be shaken, this must be bad", I thought. She pummeled the doctor with questions. Michael, who was perched near my head like a mother bird protecting her eggs, was trying to listen and comprehend. My mom came over to me, finally free from the grips of Dr. Intensity and we made a face at each other like "What the hell was that inquisition about?" We kind of giggled a little and Nurse A jumped on me and said "Shari! Was that a pain, are you experiencing any pain right now?" The whole room stopped and focused on me, and I realize just how serious this all is. Michael told me later that when Dr. Intensity called him, he said "Your wife is very sick. She is in heart failure and has peri pardum cardiomyopothy. About 10% of the patients come out fine from this with minimal complications and 40% survive but need a heart transplant". Michael asked "What about the other 50%"? The doctor simply said "They don't make it." Fast forward three more days in the hospital and I was on my way home. I was very weak, on a beta blocker and in need of healing time. But there was hope that I was going to be ok.
My amazing friends came during those three days in the hospital and four more days and took care of the boys during the day. At one point there were four girlfriends and five children in the house! Three of those children were babies and were only 1 week to 3 months old. The other two were toddlers. They stayed for eight hours each day, feeding the gaggle of little ones. Thank you girls. It took a good six months to a year for me to feel like my old self again. I still have something called POTS (Postural Orthostatic Tachycardia Syndrome), but it is manageable and I am just lucky I didn't need the transplant. The boys kept us so busy for a year and a half. Walking, talking, doing twin things. It was a blast. It was exhausting but amazing all at the same time. Watching twins discover each other for the first time was like seeing a horse turn into a unicorn. Just unbelievable!